I've recently showed my Mannock SE5 in the official painting thread. As mentioned there, my aim is to match the original "Wings of War" look with minimal additional effort. That means no rigging, a minimalistic pilot figure, and a somewhat simple paintjob (be warned: there are silver guns, too!). I use my smartphone cam and the included image editor for my convenience in creating the single posts in time - so please excuse the possible inferior image quality. - The white block is made of Styrodur. Its used for arranging and fixing the wings, before the struts are added. - The sandpaper has a grit size of 1000. I let the sandpaper soak in water before I use it. - Plastic glue: I've startet modelling with a needle glue, but over the years I preferred the one with the pencil. In my opinion it is superior in controlling the amount of glue to apply. Last edited by Karo7; 03-24-2019 at 11:02. Use the small wooden pegs to fix the fuselage parts. Check especially the front opening, the cockpit opening and the end of the fuselage for correct alignment. Last edited by Karo7; 03-26-2019 at 17:00. Excellent, clever use of the peg to hold the landing gear wing, I have wonky wheels because I didn't think of this. Beautifully explained Florian. Looking forward to the next part. I have a Valom kit which has been sitting in a cupboard for a long time now. I think I shall try and follow your examples - see what happens. thanks. REP inbound. Clear and concise stuff, Florian! Thanks for posting. I look forward to more of the same. That's really great, Florian. Well done indeed. Thank you all for the motivating comments. I had the intention to make a tutorial for the build of my D.VII Berthold a few month ago. I made images of the whole build with a digi-cam, but didn't find the time to put them in a thread. The method I use now is much more convenient. I hope to make the second part with applying the bottom wing, elevator and rudder, this night. I will adjust the paint job on my recently build SE5a to the match the comming release of the WGF models and show the process on the SE5a shown here, too. Last edited by Karo7; 03-27-2019 at 12:52. The first five pictures only show as "Attachment"s, though. Thank you for the hint. I have uploaded the images, again. Last edited by Karo7; 04-12-2019 at 08:29.
wish this thread existed before i tried assembling the valom se5as i worked on. wouldve saved me some sweat! That’s fantastic work, Florian. I loved your use of the grid and the styrofoam blocks. A++++ job. Thanks for posting this, I know that one of the metal plane kit suppliers provide jigs to fit the Wings and struts but your styrene jigs are a great idea, for the brass bits including the undercarriage. The way you have laid out the pictures is far better than a verbal description. I have the Fokker Elll kit to make soon so this has been a very informative posting for me. I will add the comments tonight. My next kit is a Valom E.III, also. The next part is about painting. Having seen all the problems that you had to overcome with the preparation and fitting of the parts, it makes me very disappointed with the quality of the kit. Unfortunately the white base coat began to crack. This was the first time I had this problem. Maybe the spray can was to old or to cold or the humidity or temperature wasn't ideal. I use a wet pallette for mixing the paint. I always dilute acrylics with water and apply them in multiple thin layers to avoid brush strokes or covering of fine details. I typically need 2-3 layers until the paint covers completely. The colours shown are made by Reaper Miniatures, but were relabeled by a German publisher, but the English names are identical. Now a gloss varnish should be applied to protect the paint. I did this step on Mannocks plane. The following photos show Lewis plane, were I skipped the varnish for test purposes, as I've red, that the silvering of decals is prevented by the decal softener, not the pre-varnish. That's correct, but the decal softener dissolved the paint, so I don't recommend skipping the pre-varnish. Now it's time to add a further coat of varnish to protect the decals. This will help fading the decals with the paint, too. I suggest the "bulletproof" (or beer'n'brezel proof) varnish for perfect protection for gaming miniatures: apply a coat of gloss varnish, let it dry thoroughly, and then apply a coat of matt varnish. 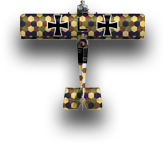 My next builds are the Valom Fokker E.III. Maybe I post some of the tricky steps in a slightly shorter tutorial. Last edited by Karo7; 04-12-2019 at 08:35. Yikes! I hope that it works out that you can cover those spots. Unusual...but as I found out with the E.III using old materials can be trouble. Painting in thin layers gives an excellent result - and teaches patience. I wonder if it was mould release agent that caused the undercoat to flake off,sometimes it's a good idea to wash plastics in a soapy solution to remove any surface coatings from the injection moulding process. No, I can foreclose this, because I always wash miniatures and model parts with soap water. I think the can wasn't shaked well enough, because there was only little paint left in it. Additionally the can was standing in the cold basement. I should have put it in a warm water bath before spraying. Nice Work Florian. I think you may have forgotten to mention how long the 'fun' part took. I need to compare your hourly rate to the current NEXUS/ARES value. I've added the duration for the last two parts. I guess you can deduct 33-50% for taking pictures, and adding notes on them. I needed about a further hour after every part to select photos and adding comments. If you calculate a hypothetical loan per our to the purchase cost, Valom models lead the ranking of the most expensive plane option. On the other hand: I love model building so the invested time was very rewarding for me. Last edited by Karo7; 04-12-2019 at 09:21. Thanks for the great instruction and advice , I will consider making and painting my first model (and will be this one if I do). And there's the rub. Having seen this you may have persuaded me to invest in some Valom kits. I've warned myself off them with some of the reports of how difficult they are to assemble but your pictures make it look straight forward and you've shown some neat assembly tricks. I do love a 1/144 kit but my collection is mostly Revel/Dragon jets. Thank you Mark. If you never build a model, I recommend neither to begin with a biplane nor with the 1/144 scale. You should avoid metal parts and short run kits for your first try, also. Take a good quality kit in 1/72 or 1/48. Maybe one of the new Airfix kits (out of a new mold) or one by Eduard (Weekend Edition or just the sprues from their website). I suggest a plane with a simple design like a Me 262, a Gloster Meteor or a Dassault Mystere. It would be a pitty, if your first attempt is frustrating and you abandon this fascinating hobby, therefore. My first model kit was a Fairy Swordfish Floatplane and the struts and float undercarriage annoyed me so heavily, that I avoided model kits for years. Galland and his gang, man! With Style!